Deputy Prime Minister Vuong Dinh Hue has highlighted remarkable results of Vietnam's economic development in 2018 and made positive forecasts for the national economic growth in 2019 in an interview recently granted to the Vietnam News Agency. Accordingly, the country’s GDP recorded the highest growth ever of 7.08 percent in 2018, making the economic scale increase quickly too, hitting 240.5 billion USD, 1.3 times higher than that of 2015. Per capita income approximated 2,600 USD, up nearly 200 USD compared to 2017, Hue said. The Deputy PM highlighted efforts from all sectors to fulfill and surpass the GDP growth target set for 2018, saying that available resources have been fully tapped to ensure sustainable and comprehensive growth. Processing, manufacturing industries and service sectors remained the key contributors to 2018’s growth, he noted. In addition to the high growth, the quality of growth has also improved remarkably with increasing productivity, quality, efficiency and competitiveness of the national economy,which was reflected by the TFP (aggregate factor productivity) index reaching 40.23 percent in the year, as compared to 33.58 percent in the whole 2011-2015 period. He underlined the need to not only promote economic growth, but also strengthen macroeconomic foundations and control inflation. The Deputy PM also voiced his concern about issues related to disbursement of public investment, equitization and divestment of State-owned enterprises (SOEs)and handling of weaknesses in big projects, which still remain slow, especially in key ministries, sectors and localities. 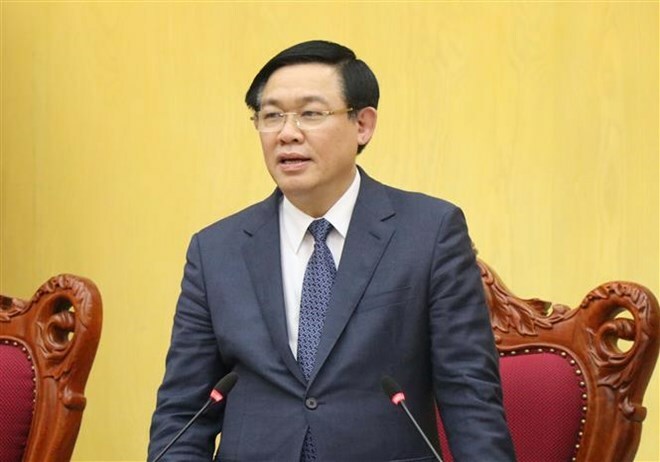 More attention must be paid to tightening administrative disciplines, especially the responsibility of leaders in organising the implementation of duties, thus creating breakthroughs to well fulfill set goals and tasks, Hue said. Despite the substantial and comprehensive achievements last year, in their speeches, Party General Secretary and President Nguyen Phu Trong and PM Nguyen Xuan Phuc shared the view that Vietnam will still face major difficulties and challenges in 2019 and the following years. Hue noted there remain long-standing weaknesses that cannot be resolved overnight. It is necessary to simultaneously build production capacity and strongly dealing with loss-making projects. While unpredictable developments still happen in the world economy such as fierce trade wars between big economies, the openness of Vietnam’s economy is considerable. Therefore, the country needs to make stronger efforts, carry out concerted and comprehensive solutions and stay clear of complacency to fulfill all socio-economic development tasks for 2019, he said. Pointing out things that need to be done, the Deputy PM said ministries and sectors whose activities cover a wide range of economic issues like the Ministry of Planning and Investment, the Ministry of Finance, the State Bank of Vietnam and the Ministry of Industry and Trade should be more active in making forecasts and proposing solutions. They must always remember that consolidating the macro-economic stability is the top priority. Additionally, they have to create a truly favourable investment and business climate for all enterprises, especially private firms, to develop and become one of the important driving forces of the economy, he said, admitting that this is a challenging problem. Hue added ministries and sectors also need to step up the equitisation of State-owned enterprises, divest State capital from companies more substantively, and push ahead with reforming the growth model in order to improve the economy’s productivity, quality and competitiveness.